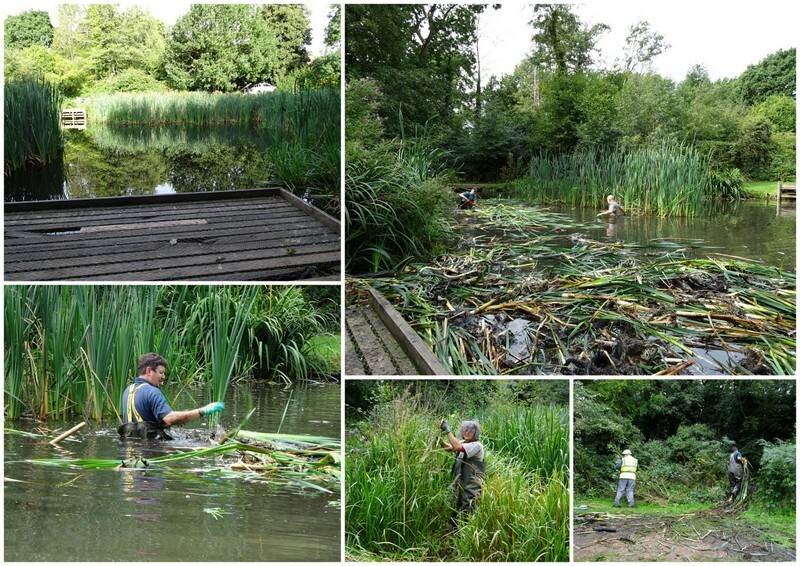 On Friday we ventured out to Thorpe Marriott to clear in and around a pond on behalf of the Broadland District Council. In an attractive spot between Marriott’s Way and Suter Drive a pond was gradually getting choked up with reed mace and needed to be cleared. There were also plenty of other jobs to do (for those who didn’t want to venture into the water!) including cutting back the sides of the paths, repairing broken rails on a kissing gate and replacing boards on a fishing platform. We were joined by some local volunteers from Draituna Trees, who regularly undertake conservation work in the area, and James from Broadland District Council. Also, there was a local man (another Chris) who had come to fish in the pond but on learning that we were about to jump in and create a disturbance decided to stay and join us instead. So, he donned a pair of Chesters (chest high waders) and got into the water with other brave volunteers to pull out the reed mace and float them to the bank. The water was around chest deep in places so the Chesters provided just enough coverage to keep them dry. The reed mace pulled out easily and was dragged out of the pond and stacked onto the bank. There was a lot of it and it was very wet and heavy, and it took much of the day to clear this. Nobody fell in despite the uneven bottom and uncertain depth! Several of the boards on the fishing platform had rotted and were broken. Fireman Chris spent much of his time removing these and replacing them with nice new boards. Netting was afterwards stapled to the platform to provide an anti-slip surface. 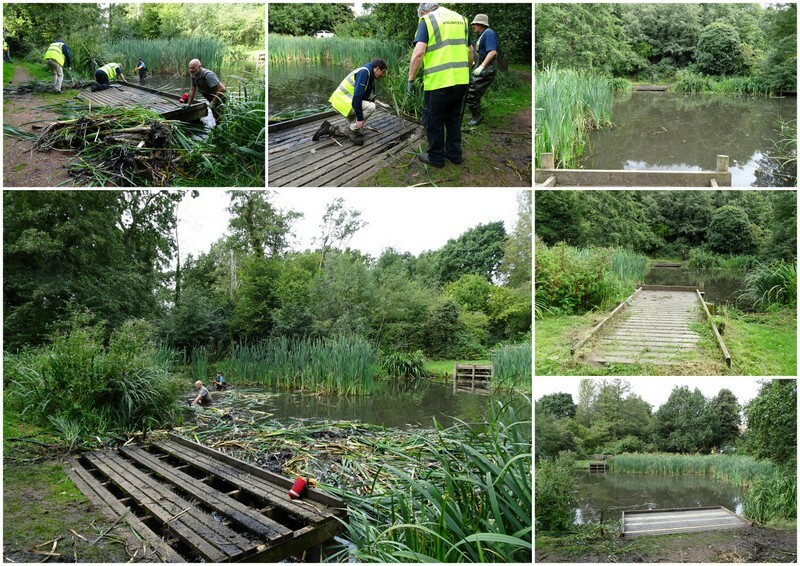 The rest of us cut back the path edges and over-hanging branches and repaired the rails on the kissing gate and helped to clear the reed mace away from the pond. Another successful day managing the countryside for local people to enjoy.